I always thought this had something to do with a Bill Cosby book that doesn’t seem to actually exist. I’m probably thinking of a section of Himself, but I thought he wrote a triptych of books on growing up (I couldn’t give a title for this), raising a family (the nonexistent “Parenthood”), and getting old (Time Flies). If one of his books of comedic anecdotes were filmed, he’d probably have been cast as the star anyway. It sure seems like I’ve reviewed this before. 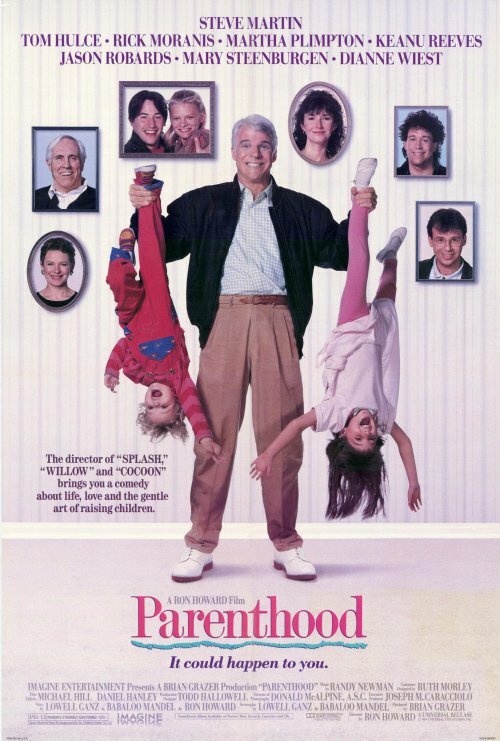 It seems to be a sibling to Father of the Bride, and the synopsis sounds an awful lot like Cheaper By The Dozen, which not only has a “suggested by” not-remake with Steve Martin, but also, as I discussed, seems to have been made many times as many different movies. So, here we go again? The Buchmans are a dysfunctional clan. The patriarch of the family, Frank, was always distant, and gave the impression of treating parenthood as a chore, so Gil swore he’d be the best father ever for his own kids, which is tested by his oldest son’s emotional problems pushing him into special ed. Gil’s sister Helen was left by her husband to raise their two children: a teen with a no-good boyfriend and a preteen who locks himself in his room whenever he’s not going “out”. Other sister Susan is married to a scientist too invested in raising their daughter to be the most intelligent human on the planet to consider Susan’s needs. And the black sheep of the family, Larry, has just returned home with the latest collection of gambling debts to be bailed out of and also a mixed-race son the mother dumped on him before fleeing the country. This all more or less covers the most common struggles of raising families in the late 80s. I don’t think anybody in this movie was cast for family resemblance. I thought I could read one between Rick Moranis and Tom Hulce, but Moranis’s character is in the family by marriage. The benefit, however, is that pretty much everyone gives a wonderful performance. Acting-wise, there were no poor choices made. Even the kids provide some great work. I may have rolled my eyes when I read that this movie was later adapted for television (twice! ), but this has so many characters and plot arcs to juggle that it almost doesn’t work, and I’d appreciate more room for everyone’s story to breathe. Not only does it have two official TV series, the concept of a very large extended family multigenerational ensemble dealing with very contemporary problems the previous generation didn’t generally face reminds me of Modern Family. The biggest problem resulting from having such a large cast crammed into two hours is that Frank’s wife (the adult children’s mother) is pretty much crowded out. As far as I recall, all she does is come to the big family dinner and watch Larry’s son because neither Larry nor Frank are getting involved with him. She doesn’t even get to be the matriarch of the family because her mother is still alive to be the Slightly Scandalous Grandmother. “Grandma” is a delightful character, not nearly as in your face about defying expectations and raunchiness as we get nowadays, but it’s a shame her piece seems to come largely at her daughter’s expense. This film is at turns hilarious, tragic, overblown, underplayed, banal, and poignant. It twists and turns through an impressive number of lives and gives most of them heart, soul, and wit. The smallest moments often mean the most, and the biggest setbacks may have the lowest stakes. It’s mixed up, unexpected, silly, and beautiful. Life and family distilled onto celluloid. You may have been thinking of Cosby’s book _Fatherhood_.